The Conservatory at Duncombe Park was designed by Robert Richardson Banks and Sir Charles Barry in 1851. Barry is famous for his design of the Palace of Westminster. At the south end of the terrace at Duncombe Park is the circular Doric Temple attributed to Sir Thomas Robinson. The Father Time sundial dates from about 1715 and is attributed to Van Nost. The icehouse at Duncombe Park has recently been restored. 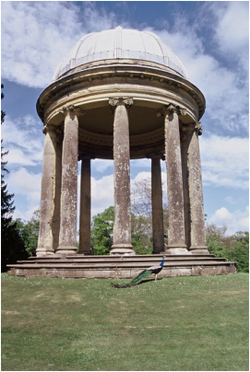 The Ionic Rotunda is at the north end of the terrace at Duncombe Park and is attributed to John Vanbrugh. ​John Vanbrugh designed The Rotunda at Stowe, Buckinghamshire. At one time there was a Round House in the market place that was the lock-up. Sir Gilbert Scott designed the Memorial in 1869 for the tenants of the second Earl of Feversham, in memory of him. The style is similar to an Eleanor Cross, like the one at Hardingstone, Northamptonshire.